How Can I Start Winter Sowing? For garden-lovers, winter in the Northeast can be a less exciting time than the spring and summer. However, there is indeed a way for you to do something for your garden in the winter. This method is low-cost, effective, and will produce hardier seedlings than those grown indoors.Don’t believe us? Just keep reading to discover the possibilities of winter sowing. Different seeds emerge out of dormancy through different methods. Some seeds merely require some soaking or scratching. However, other seeds require cold stratification, or exposure to the cold, to break out of their dormant stage. As explained by Pennsylvania State University, cold temperatures allow oxygen to permeate into the seed and encourage it to digest some of its food reserves, giving the seed sufficient energy to germinate. In short, winter sowing is a method of cold stratification that takes up absolutely zero space in your home. Winter sowing starts seeds completely outdoors in the wintertime. It works through miniature greenhouses made from recycled plastic containers, which are then left outdoors. Once the weather begins to warm up, the seeds will grow at their normal pace. Winter-sown seedlings have no risk of damping off, when new seeds and seedlings become water-soaked and quickly die. Because these seedlings grow outside from the beginning, they also do not need to be gradually exposed and introduced to the outdoors, a process known as hardening off. All things considered, winter sowing will make your life and the life of your garden considerably easier. The first step to winter sowing is to prepare the “mini greenhouses” for your seedlings. These are made of transparent or translucent plastic, such as milk jugs, liter bottles, or other similar containers. It must be deep enough to allow for two to three inches of soil at the bottom, and tall enough for seedlings to grow. After you have chosen your container, make sure to clean it thoroughly. If you are using a milk jug or tall container, cut the container in half horizontally. Using a knife or drill, poke the same amount of holes in the top and bottom of the container to allow for venting and draining. Rain and moisture will be able to enter and drain out. The holes will also prevent the “greenhouse” from overheating. Add a layer of high-quality, all-purpose potting soil. A layer that is about two to three inches is sufficient. Never use soil from your garden in your containers! For winter sowing, marigolds, poppies, brussel sprouts, carrots, leek, and spinach are just some seeds that should grow well. For more ideas, refer to this list. By the time spring rolls around, there’s a good chance that you won’t remember what you have sown. Be sure to label your containers using a permanent marker or masking tape. Water your soil thoroughly and allow the containers to drain before moving them outside. Place the lid of your container back on, making sure that it snaps shut. If you have cut your container in half, simply attach the half back on using duct-tape. In this case, be sure to leave the caps off. Make sure that the tape does not cover the ventilation and drainage holes. Finally, put your containers outside in a place that receives plenty of sunshine and moisture. However, make sure that the containers are not exposed to heavy wind. Don’t worry if your containers are covered by snow. Once the weather warms up, check the containers regularly for signs of seedlings. Make sure that the seedlings do not overheat and that the soil inside is adequately moist. If you notice soil drying out, add water through the ventilation holes. When the seedlings are finally tall enough to reach the top of the container, you can remove the lids. After the lids are removed, check the seedlings daily and water when necessary. You can transplant these seedlings at the same time you would plant anything else in your garden, depending on where you live. Winter sowing will bring joy to your gardening life when springtime rolls around! You won’t need to purchase grow-lights, heat mats, or other accessories that require money and space. The seedlings themselves will grow beautifully when they are planted. If you find that you have questions about gardening or your lawn, contact a lawn care professional in your area, like Giovine Landscaping, for personalized information. We are happy to help you build your garden from the ground up. Like all things, the season of winter has some pros and cons. For example, we’ll be able to build snowmen and have snowball fights, but we’ll also have to shovel our doorsteps and sidewalks. For our lawns, we’ll inevitably miss some green grass and sun and, instead, see browner, sparser lawns. But what you do now still contributes to the health and beauty of your lawn in the spring. For this reason, it is extremely important to protect and maintain your lawn even in the winter. Thankfully, the steps to winterize your lawn are pretty simple. The first and most important step to winterizing your lawn is to apply ample fertilizer. We suggest using a spreader, as it will allow you to spread the fertilizer as evenly as possible. Use only the recommended amount as too much fertilizer can burn your grass. Then, scatter cool-weather or cool-season grass seed on your lawn, preferably with the same spreader you used for the fertilizer. The next step is to aerate your lawn. This comes with many benefits, such as improved air circulation between the soil and atmosphere, greater fertilizer uptake, and reduced soil compaction. You can use a spike aerator, which uses spikes to poke holes into the ground. The other option is a plug aerator, which removes small plugs of soil from your lawn. If you have a large lawn, consider contacting a professional contractor, like Giovine Landscaping, to quickly and effectively help you with this. Before severe snow hits, be sure to clean up your lawn. Leaving things like leaves, debris, or toys on the lawn make it susceptible to disease and could smother the grass. Poor conditions like these invite pests like insects and mice. Grass that is excessively long can smother itself and cause disease. It can be particularly troublesome if you experience a late freeze or an uncharacteristic thaw. These weather conditions can cause a freeze-thaw cycle, which exposes your lawn and plants to damage. When there is an isolated rise or drop in the temperatures that is followed by regular temperatures, your garden will experience a freeze, followed by a thaw, as explained by the United States Golf Association. The thaw falsely signals to plants that temperatures are warming and spring is near. If plants do begin to bud and bloom, they will become exposed to damage from the cold. Although we certainly cannot control the weather, trimming our grass a little shorter for the winter is a good idea. However, be sure to avoid cutting it too short, which will expose the crown to extreme weather. It may sound a bit troublesome to winterize your lawn, but we are sure that you’ll be grateful for having fully prepared your grass to brace the cold weather. We encourage you to take a weekend to prepare your lawn or reach out to a local company to help you take care of it. Then simply sit back and spend the rest of your winter without worrying about your lawn. What is Lawn Dethatching and Why Do I Need To Do It? We bet that you didn’t know about all the work required to upkeep a beautiful lawn until you had your own lawn to take care of. We understand that not everyone is an expert on grass and turf. If you’ve never heard of the term dethatching before, or you’ve heard of it but have no idea what that means, read on to find out if lawn dethatching is in your future lawn-care plans. So What Is Lawn Dethatching? In order to answer this question, we first need to explain what thatch is. You may think of thatch as that quaint material that old English cottage roofs are made of. 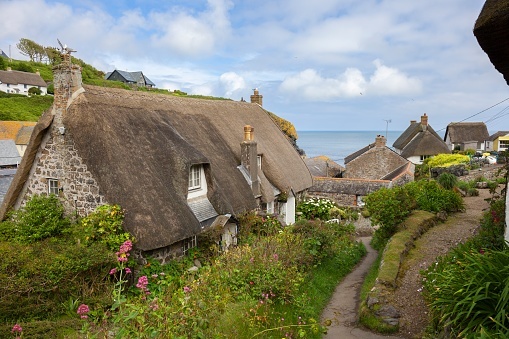 However, you don’t have to live in the English countryside to have thatch. Thatch can be found in anyone’s lawn anywhere in the world. Over time, tiny bits of grass die and accumulate on the soil. This forms the basis of thatch. It is a layer of living and dead stems, roots, and crowns right above the soil surface. If you take a look at your lawn, thatch will look like browned grass stems matted together. In moderation, thatch is actually beneficial for your lawn. As reported by the Penn State Department of Plant Science, less than ½ inch of thatch helps to insulate your lawn from extreme weather, protect weed seeds from reaching the soil and taking root, and help the soil retain moisture. However, any thicker and thatch will act as a foe against the health of your lawn. Excessive thatch increases the risk for pests and diseases to thrive. Not only does it reduce the ability of fungicides and insecticides to penetrate the soil, but it also reduces the amount of moisture and oxygen that can reach roots. How Can I Tell If I Need Dethatching? There are multiple ways to tell if thatch has built up on your lawn. First, upon walking on your lawn, you will notice that it is spongy. When you try to stick your fingers (or a screwdriver) into the soil, you will find it difficult to do so. Lastly, you will see that water will run off the grass rather than penetrate it. If you’ve noticed any of these signs, or a combination of multiple, your property is in need of lawn dethatching. Generally, there are two ways to dethatch lawns. The first is to use a dethatching rake, which will rip the layer right out of your lawn. By hand, you must dig deep into your lawn and pull upwards to loosen the thatch apart. When doing this, the thatch should be visible. Your lawn will look visibly ragged after this and will need to be cleaned up. If you have a large lawn, you can consider the second method, which uses a power dethatcher. You can rent this tool from a rental agency, which should supply you with instructions. Dethatchers are heavy, and you may need not only a truck but also (at least) one spare pair of hands for loading and unloading. When using the dethatcher, you must also be careful to use it in a pattern that covers the grass only once. Given that the process of lawn dethatching is time-consuming, technical, and physically taxing, it’s no wonder that thousands of homeowners choose to hire a professional agency to take care of the job. If you choose to opt for this alternative, make sure you choose a reputable landscaping company, like Giovine Landscaping Inc., to help you achieve a healthy, flourishing lawn. Don’t let thatch get in your way. For better or for worse, the first thing we see when looking at a home is its lawn. Before we even get to step inside and admire the interior, our first impression forms right as we walk up to the front door. In order to keep your property looking its best, regular lawn fertilization is a necessity. How Does a Well-Maintained Lawn Affect Your Home’s Curb Appeal? For a relatively insignificant cost, proper and professional care of your lawn will bring you high returns. A beautiful home exterior tells potential buyers, neighbors, and passersby that your home’s interior is equally appealing. For potential buyers, a well-maintained lawn means fewer initial costs coming out of their pocket, which drives up the desirability of your home. An attractive lawn even benefits your neighborhood as a whole and increases its marketability. Trust us, your neighbors will be thanking you. How Do I Take Care Of My Lawn? The key to maintaining a lush, green lawn is regular fertilization. Most existing nutrients in lawns are water-soluble and will be diluted and washed away over time. Sometimes, soil might not naturally produce the necessary nutrients for a healthy, full, and even lawn. This increases its vulnerability to stressors such as extreme weather, disease, weeds, and pests. Your lawn can be left with uneven discoloration, browning grass, and overall patchiness. This is no way to make a first impression! If you live in the areas of Essex, Morris, and Union Counties in New Jersey, chances are that your lawn has cool-season grass. This type of grass typically remains green all year round and grows throughout the year, except during mid- and late-winter. Fertilization is recommended twice a year, once in early spring and a second time during the fall, around October and November. Why Is Lawn Fertilization Tricky to do on Your Own? Although there are online resources on DIY lawn fertilization, this is a job that should be left for professionals. According to research from the Division of Agriculture in the Department of Arkansas, there are many factors to consider in turfgrass maintenance. Firstly, you must have your soil’s pH level tested and the soil type identified. The pH levels contribute directly to grass health and nutrient uptake, and can indicate a mineral deficiency. Improper pH levels result in ineffective use of fertilizer, as well as increased pest problems. It is crucial to have your unique landscape evaluated by certified professionals before anything is applied to your lawn. On top of that, you must accurately calibrate the spread of your fertilizer based on a careful measurement of your lawn. Application of nitrogen requires precise timing and vary by turf species. All in all, a healthy and proper lawn fertilization is no easy task. We strongly advise leaving this in the hands of experts and professionals. If you want to keep your valuable property in its best shape, the team at Giovine Landscaping Inc. can help. We provide unparalleled service and pride ourselves in our precision and professionalism!